There are few artists as important and as innovative today as Ai Weiwei and it is easy to see why in Alison Klayman’s new documentary Ai Weiwei: Never Sorry which follows the Chinese artist from his work on the Birds Nest Olympic stadium in 2008 to his prison release last year. She shows how he moves from one of the nation’s stars to something close to an enemy of the state, giving some background on the turmoil in which Weiwei grew up, which adds insight. From the opening scene, it’s fascinating to observe Weiwei’s laid-back attitude as his pet cats pummel one of his works in progress and it sets the tone for the film which shows the great “art hooligan” as a primarily reactionary figure who’s not so much picking a fight as he is creating works that speak about preserving the natural rights he enjoyed during the years he spent in New York in the 1980’s. Weiwei’s art may take a backseat to his life in the film but it’s understandable because of his charisma and the fact that the works blur the line between the artist and the political figure, but the art works themselves are truly impressive too and there may be no other artist who uses blogging and twitter quite as well as Weiwei does. Ultimately, the film is a truly inspiring look at an artist with a tremendous amount of courage who continues to both create meaningful works of art and do what he feels is right despite the potential consequences. 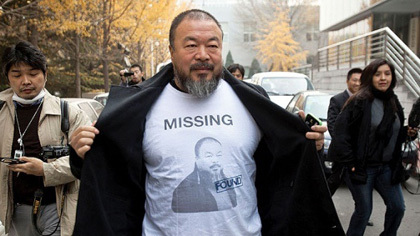 Ai Weiwei: Never Sorry opens in theaters July 27th.